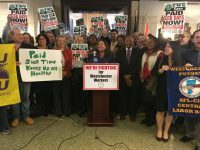 Hundreds of Westchester County residents, union members and county employees were in attendance as Board of Legislators Majority Leader Catherine Borgia (D-Ossining) introduced an Earned Sick Day Bill Monday afternoon. With approximately 36 percent of workers in Westchester lacking paid sick days, this bill is proposing that all workers receive a minimum one hour of earned paid sick time for every 30 hours worked. Borgia added that after similar laws went into effect in places such as New York City, San Francisco, Washington, D.C., and Seattle, statistics show that employees are healthier, businesses are thriving and there have been no negative impacts. “Statistic show that workers don’t abuse this rule and that we have less cost associated with people going to work sick and affecting other people. There’s fewer trips to the emergency room and it will actually save Westchester money since they cover the Medicare and Medicaid costs in the county,” she said. Donna Dolan, Executive Director of the New York Paid Leave Coalition agreed, stating that this law has established earned sick time standards, resulting in better individual and public health, and greater financial security for families, businesses, the community. Majority Whip Alfreda Williams (D-Greenburgh), Legislator MaryJane Shimsky (D-Hastings-on-Hudson), Legislator Ben Boykin (D-White Plains), and Legislator Catherine Parker (D-Rye) all agreed that this is a common sense law that is vital to supporting county employees. Additionally, the Earned Sick Day law can be used for both physical and mental illness and will also provide sick leave to employees who need to take care of an ill family member. If unused, the paid sick hours accrued over the year may be transferred over into the following year. The Transport Workers Union Local 100 (TWU), Westchester-Putnam Central Labor Body AFL-CIO, 32BJ SEIU, A Better Balance, New York Working Families, New York State Nurses Association, along with several other organizations and advocates also stand in support of this policy. Thomas Carey, President of the Westchester/Putnam Central Labor Body AFL-CIO, U.A 21, stated that his members are honored to stand in solidarity in support of this policy. The bill further provisions for businesses with five employees or less that will allow workers to accrue unpaid, but job protected sick time. “This is a basic right, our membership shouldn’t be put in a position where they have to choose whether to feed their family and come to work sick or take a day off,” said Gus Moghrabi, Executive Board Member of the school bus/para transit for TWU, an organization that represents roughly 2,000 workers including bus drivers and bus monitors. “We transport the most precious cargo in Westchester—our children, and we need this to pass through,” Moghrabi said.